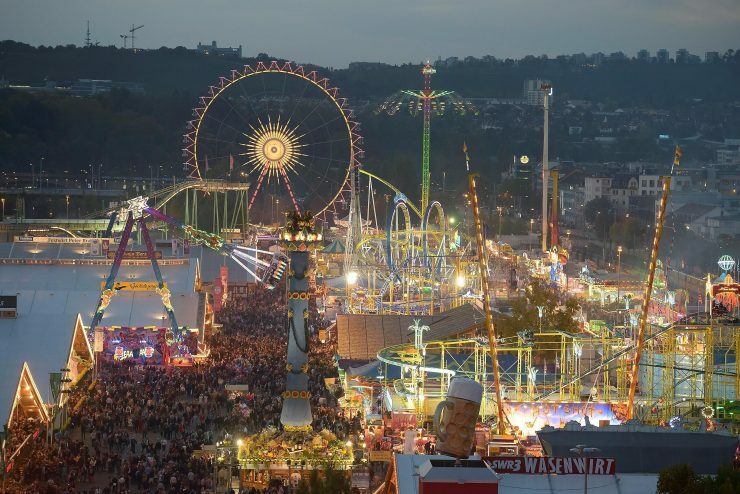 With almost 200 years of existence, now the citizens of Stuttgart and their visitors gather in family or among friends at the Cannstatter Wasen festival, the 35 hectares part of the well-known Neckarpark, this popular festival is developed on the banks of the Neckar river, The festival It combines the traditional with the modern, enjoyed by four million visitors annually from all over the world. For 17 days, young people and adults taste to celebrate, enjoy and have fun and forget the everyday life. All around a column of fruit that is the historical symbol of the festival with more than 330 hosts, shelves that show and present a wide variety of attractions. Roller coasters, bumper cars, games for children, rides, ingenious game gardens and games of chance for both adults and children. Within the seven beer pavilions, and two wine pavilions, a villa inspired by the Suabas Mountains, beer gardens to seat more than 35 thousand people, the beer festival presents a variety of programs and visitors can enjoy the special beer made for the festival, both inside and outside the pavilions visitors can enjoy both traditional music and contemporary music and fashion, complementing this, the two wine pavilions allow visitors to enjoy the good local wine, enjoy also music and dance, a guaranteed afternoon of fun. Traditional cuisine, typical costumes, rides, live music, lots of beer. Admission is free, although there are some shops or pavilions with special events with entrance fee or by invitation.